A group of freshman conduct research during a final session of FRI. Photos by Tindall. Freshman Research Initiative (FRI) keeps doors open. That’s what Olivia Taylor has found. “I think it’s really important that you explore all of your opportunities and figure out exactly what you want to do and be confident about it by the time you graduate,” she advises. Taylor’s FRI group is one of four environmental engineering-focused research teams taking part in this semester’s guided projects. Each group’s study is unique. Tyrrell’s group is studying how rooftop materials shed contaminates during storm events. Taylor’s group is discovering possible correlations between E. coli colony growth rates in local streams and precipitation rates. Along with the labs (the most fun part of FRI, according to Tyrrell), both Taylor and Tyrrell agree that friendships and networking with faculty is top on the list of why students should take part in this research opportunity. 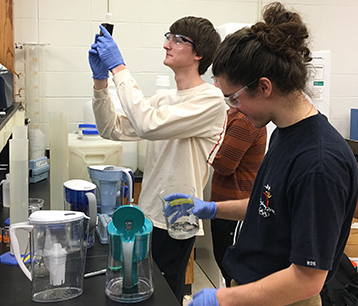 Freshman Research Initiative is in its third year at Iowa State University. Streams of around 15 students in introductory classes are co-opted into faculty members’ research programs. During the fall and spring semester, students take part in both departmental and university-wide showcases. This semester’s showcase took place on Apr. 26. In Iowa State’s Department of Civil, Construction and Environmental Engineering (ISU CCEE), there are two distinct streams: environmental engineering and transportation engineering. Rehmann and Assistant Professor Kaoru Ikuma co-instruct the environmental engineering stream. “I feel students should participate in the FRI because it provides an immediate and meaningful introduction to the CCEE program, to research, and to department faculty,” Associate Professor Peter Savolainen, who instructs the transportation stream during the fall semester, explains. This program is supported in part by a grant to Iowa State University from the Howard Hughes Medical Institute through the Science Education Program. Get an inside look at more interesting student opportunities by following ISU CCEE on Facebook, Twitter and LinkedIn (Iowa State University Civil, Construction and Environmental Engineering and ISUConE). What a wonderful opportunity for Freshman to get their feet wet from the get go. There are so many talented new students and it’s great they don’t have to put their energy and talents on the shelf till their sophomore or junior year. Congrats Iowa State and our Granddaughter Olivia Taylor. Wonderful to see your involvement in your Civil Engineering courses. Should be inspiring to all freshman.